McLaren’s in-house team already has some outstanding machines to work with. That doesn’t stop the folks at McLaren Special Operations from turning a fantastic supercar into something even better. This time around the bespoke treatment falls to the 720S Spider, which receives interesting tri-tone accents to select areas on the exterior. That work is mirrored with an updated interior as well, but in reality there's so much more involved than just that. In short, the blue hues ghosted into the Spider’s Meteorite Grey exterior – itself a new color available through MSO – are designed to provide a visual representation of airflow across the body. Looking closely, however, you’ll notice the blue accents aren’t strictly blue. The color is officially called Coriolis, and it’s a tri-tone shade comprised of Cerulean Blue, Burton Blue, and Abyss Black. Furthermore, MSO’s specialists spent over 260 hours applying the paint in a very specific manner to create the beautiful fades and transitions seen here. What does it really make? There’s more blue inside this MSO-tweaked 720S, though the detail isn’t quite as drawn out. The interior trim is Burton Blue Alcantara, set against black leather and all kinds of carbon fiber. To that end, gloss carbon fiber can be found on various trim pieces outside the car as well. The wheels are also unique to this car, with the 10-spoke alloys getting a gloss black finish. 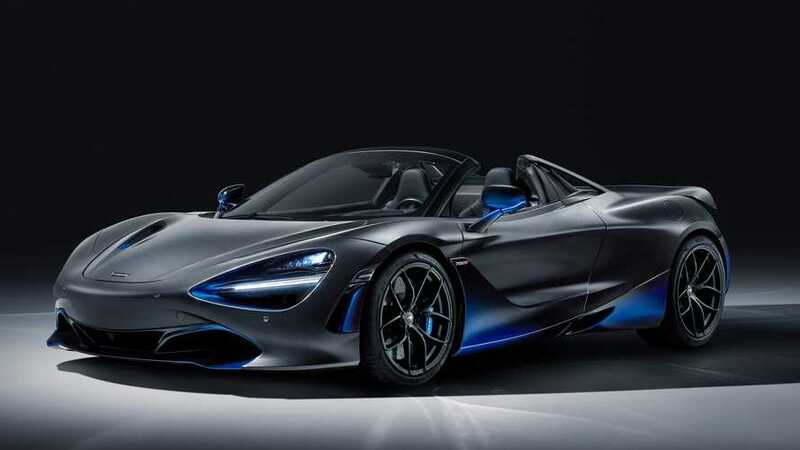 McLaren revealed the special 720S to crowds at the 2019 Geneva Motor Show. Aside from showcasing the sheer artistry of the MSO specialists, the car serves as a reminder to potential McLaren customers that special touches such as this are available straight from the manufacturer. For a price, of course. MSO Defined features chosen for the car include a Gloss Carbon Fibre Tonneau Cover; this complex component has been specially developed for the 720S Spider and combines with carbon fibre treatments to the rear deck, and carbon fibre extensions to the upper trim and sills to demonstrate an almost seamless flow from the cabin to the rear of the car. The carbon fibre treatment also includes the diffuser and B-pillars, whilst other options include a sports exhaust, Stealth Pack - which adds more of a subtle, darker finish to the exhausts, airbrake mechanism, exterior window surrounds and oil cap cover panel - and Electrochromic glass for the panel of the retractable hard top. The 720S Spider seamlessly combines the Coupé’s aerodynamic performance with a one-piece retractable hard top and glazed flying buttresses. With light weight, Proactive Chassis Control II and 720PS 4.0-litre twin-turbocharged V8 engine, it is the most accomplished convertible supercar ever from McLaren – and with this MSO treatment, has the visual innovation to match.